Adam Kennedy and Matt de Boer have both put pen to paper on new contracts. We’re a special group, we’re all excited about what we can achieve and I’m looking forward to playing my role in the journey. 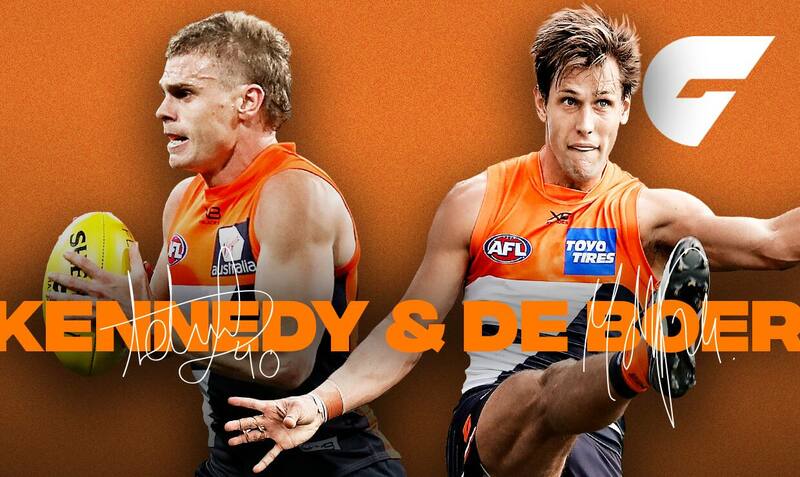 Two of the GIANTS’ most reliable players have extended their contracts with the GIANTS with Matt de Boer and Adam Kennedy both re-signing with the club. GIANTS leader de Boer has signed a one-year contract extension to take him through to the end of 2020 with the 29-year-old former Docker reinventing his football career since being delisted by Fremantle at the end of 2015 after 138 AFL games. He arrived at the GIANTS at pick 58 in the 2016 NAB AFL Draft and has played 28 games and kicked 20 goals as well as being elevated into the club’s leadership group. Outside of football, de Boer is also on the board of the Starlight Foundation in NSW as well as health technology company InteliCare. “Matt has proven himself as an important part of our group on and off the field since his arrival at the club three years ago,” GIANTS List Manager Jason McCartney said. De Boer said he was really excited to put pen to paper on a new deal. “I’ve relished the second stage of my football career at the GIANTS,” de Boer said. “I’ve loved being able to contribute to such a hungry and determined group in both a playing and leadership capacity. Original GIANT Adam Kennedy has also extended his current contract, with the zippy defender locked in until the end of 2022. Out of contract at the end of 2020, Kennedy has put pen to paper on a new two-year extension after bouncing back from an ACL injury in 2017 to play some of the best football of his career. 26-year-old Kennedy joined the GIANTS as a previous draft nominee from the Western Jets at the end of 2011 after being overlooked in the 2010 draft. From Melton in country Victoria, the hard-running defender suffered a season-ending knee injury in round seven, 2017. He returned with a bang in round 17 last year and hasn’t missed a game since, taking his tally to 95 AFL games. “We’re really thrilled to be able to extend Adam out for another two seasons on top of his current contract,” McCartney said. Kennedy said he’s excited to commit his future to the GIANTS, having spent his entire eight-year career in the orange jumper. “I love being a GIANT and I had no hesitation extending my contract for another two years,” Kennedy said. “I’ve spent the majority of my adult life in Sydney and it’s truly home for me now. The pair’s contract extensions comes hot on the heels of long-term deals to Nick Haynes and Harry Himmelberg while Brent Daniels also recently extending for a further two years.